One of the fastest growing sectors of the food and drinks industry in the UK is fresh juice. 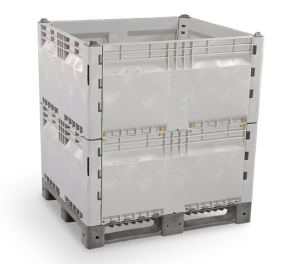 KitBins provide a lightweight, sanitary solution for Fesa Ltd.
To satisfy the needs of this market, it is now necessary for much larger volumes of products to be transported. 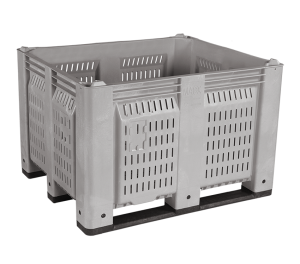 This in itself brings logistical issues, simply due to the fact that for Fesa (UK) Ltd, who are based in Spalding, high quality, whole fresh fruit is transported, rather than frozen fruit puree or juice concentrate for water to be added at a later date. Initially, the empty Kitbins are dismantled for transport, and shipped either by lorry and containers or in cargo holds to their destination. On arrival, the Kitbins are quickly assembled prior touse or assembled, as they are required at the end of the sorting and grading lines. After each one is filled, they are stacked three high and placed into cold storage before being readied for the journey. Adding to the pressures are the UK retailers who offer prices which mean that supply chain efficiency is taken to the extreme. 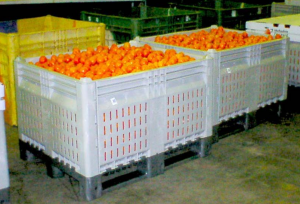 The logistics for these products is analyzed in detail to ensure minimum costs are incurred during the transport of the fruit, from distant locations that include Belize, Cuba and South Africa as well as closer supplies from Egypt and Spain to the UK. 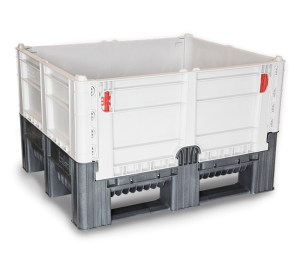 On arrival in the UK the bins are offloaded at various ports and packhouses and then “called-off” for distribution as required. Some Kitbins are placed in racking while others are placed in open stores utilizing the available floor space. The remainder of the fruit, especially from Spain, is delivered direct into the juicers ensuring minimum handling and zero UK storage costs. 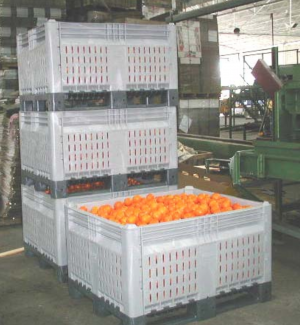 Different packaging for handling the fruit includes the simple 60cm x 40cm cardboard carton, which is still widely used. However, for one of Fesa’s end user’s, this is no longer an option. 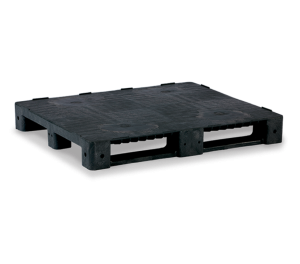 Handling limitations and space constraints mean that an on-site machine to crush or bale the cardboard after use is simply not feasible. So limited is the space, that the used bulk packaging needs to be removed daily. 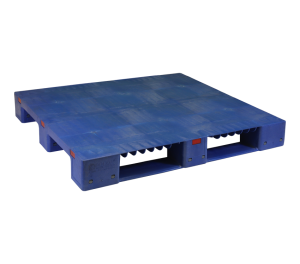 Different types of wooden bins from many locations, usually constructed with metal hinges, corner seats and/or metal straps, initially set the standard for bulk handling in the juicing industry. 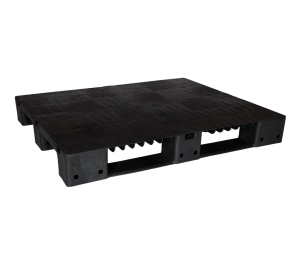 However, one of the main advantages gained from the use of Kitbins, is the complete removal of wood and metal from the supply chain, reducing the possible risk of product contamination. 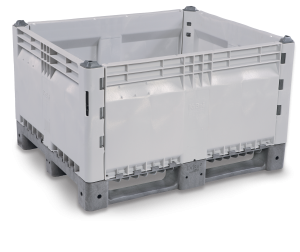 Additionally when the lighter weight of a Kitbin is compared to wooden bins, a larger net weight of fruit can be transported on each vehicle. actually carrying out the everyday practical tasks with the Kitbin. 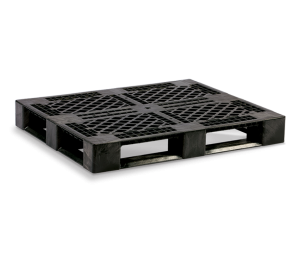 Whether in the field or packhouse, vessel or container, the Kitbin provides a real solution for this ever-changing world that is becoming increasingly environmentally sensitive and cost conscious. 39.37" x 47.24" x 5.91"